The approach below allow you more completely to change the appearance of the axis item label, but if you want to change only the foreground of it, you can use the AxisForeground property of the RadChart.Note that the value of this property will get applied to all of the axis item labels and all of the axis titles. The axis title is part of the chart axis and is represented by the AxisTitle control. To style it in Expression Blend use a dummy control to create the style and after modifying it, set it to the RadChart. Open your RadChart project in Expression Blend. On the same scene you should place a AxisTitle control which will be used as a dummy. To do so choose the 'Assets' tab. From the 'Controls -> All' section select the AxisTitle control. With your mouse create a new instance of the control on the scene. Now select the newly created control and select Object -> Edit Style -> Edit Copy from the menu. You will be prompted for the name of the style and where to be placed within your application. 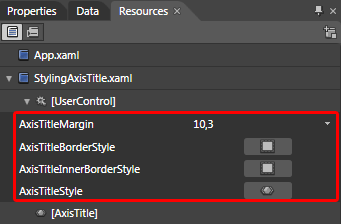 After clicking the OK button a style with target type AxisTitle will be created and the properties for this type will be loaded in the 'Properties' pane. Modify them until you get the desired appearance. If you go to the 'Resources' pane you will see that two additional Styles have been generated together with the one for the AxisTitle. They are for the borders which the AxisTitle uses in its template. Clicking on their icons will allow you to modify them. After finishing with the changes it is time to set the style. It can be set only through the procedural code, which means that you have to go to the Visual Studio and modify the code-behind file of your UserControl. 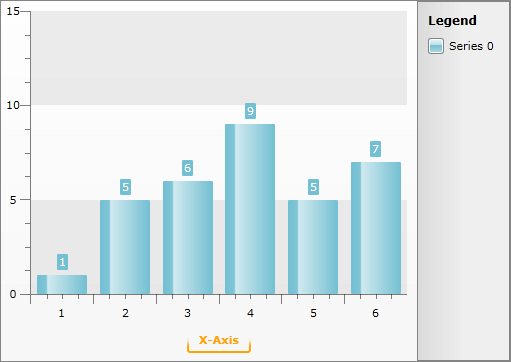 The title for a particular axis can be set through its Title property. Read more about axes here.